VOStat is a simple statistical web-service that lets you analyse your data without the hassle of downloading or installing any software. All that you have to do basically is to upload your data to the VOStat server (at Penn State University) and download the results! Step 1: Upload your data set. You may upload data from your local computer, or from some URL or via SAMP from another VO-tool, like Topcat. Step 2: Specify what analysis you want to be done. Step 3: Supply some information relevant to your chosen analysis (e.g., if you wanted to plot the data, then you must tell VOStat which variables you want to be plotted). Step 4: VOStat shows you the output. You may download the plots in different formats, or get tabular output in the form of VO tables, which may even be SAMPed into othr VO tools. Behind the scene VOStat uses R, which is the largest public-domain statistical software in the world, supported by its exponentially growing repository called Comprehensive R Archive Network (CRAN). VOStat uploads data from the user, constructs an R script based on the user's specification, applies the script to the data, and hands the output back to the user. Simple! To encourage astronomers to use statistics. To spread the use of R among astronomers. Unlike other GUI wrappers around R, we seek to teach the user how to reproduce the results directly using R. All the generated R scripts are shown to the user, along with helpful annotations. What do you need to use VOStat? Since the entire computation is done in our server, there is no requirement in terms of available space on your local machine. SAMP comminication needs trusted applets. When you come to a SAMP-enabled page (e.g., [up/down]loading data) for the first time you will see a certificate like the following. You need to allow it to run in order to establish SAMP communication. 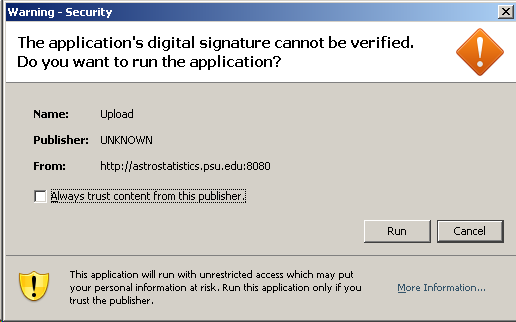 The rest of VOStat will still work even if you do not allow the signed applet to run. VOStat Version 2.0 (June 2011) is a VO-compliant Web service developed by the Center for Astrostatistics (Pennsylvania State University) under NSF grant AST-1047586 (Prof. G. Jogesh Babu, PI). The lead developer is Dr. Arnab Chakraborty (statistician presently at the Indian Statistical Institute, Kolkata India). VOStat was originally developed by a research team led by Pennsylvania State University that included members from California Institute of Technology and Carnegie Mellon University, and supported by National Science Foundation's Focused Research Group grant (DMS-0101360, G. J. Babu, PI). Disclaimer: Penn State University disclaims any warranties, including the implied warranties or merchantability and fitness for a particular purpose. The software and documentation provided hereunder is on an "as is" basis, and Penn State University has no obligations to provide maintenance, support, updates, enhancements or modifications.